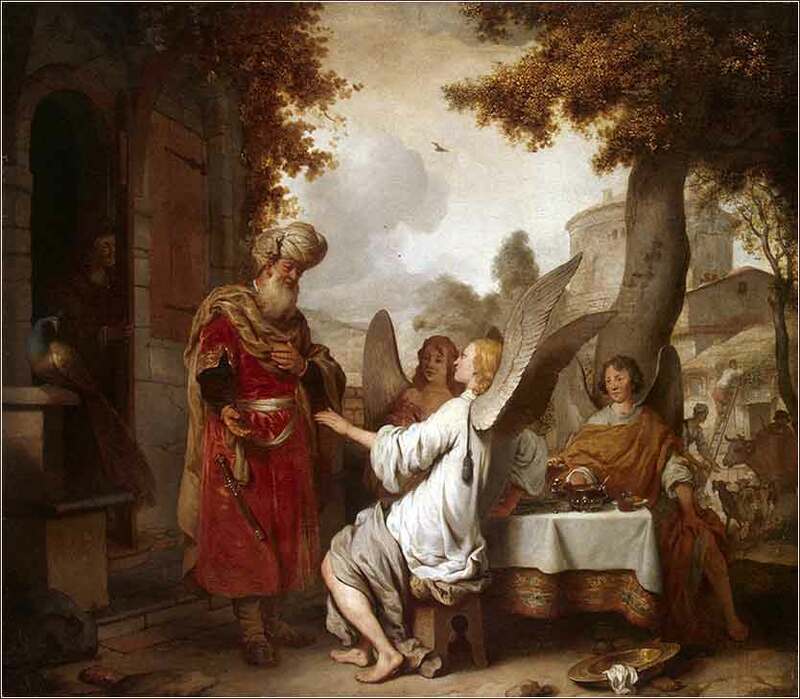 Abraham and the Three Angels, by Gerbrand van den Eeckhout (Dutch), c. 1656. Abraham and the Three Angels, Gerbrand van den Eeckhout (Dutch) c. 1656, Hermitage Museum, St. Petersburg. Note Sarah hiding behind the doorjamb. Eeckhout made some attempt to make Abraham look at least somewhat Semitic, although the three angels are European. He places him in a masonry house with fine robes, neither of which is impossible, but the scene does look more like 17th century Holland than ancient Canaan. Eeckhout shows three angels with wings, rather than God and two angels appearing as men. The wings are not representational of the story, but do identify the figures as angels. Some early scholars interpreted the three men to be three angels, but the text better supports the interpretation that the three men were two angels and God Himself. The first angel, who is wearing white and highlighted, might be a representation of Christ. The peacock is a symbol of immortality and renewal, to reflect God's promise to Abraham. Eeckhout was a student of Rembrandt, and the tone, composition, and use of shadow reflect this. He brilliantly captures the casual and friendly tone of the Scripture by the posture of the subjects. In the background, everyday life goes as normal, even though God is sitting in the village. his charming vignette began with three mysterious men showing up one day at Abraham's tent. He recognizes that one of them is the Lord, and has a feast prepared for them. As they sit on Abraham's porch — which would have been a great wool cloth supported by poles, covering the area in front of the tent — Sarah remains inside, her ear to the door eavesdropping. God has previously promised Abraham a son by Sarah, and now that the covenant has been sealed by the circumcision of Abraham's household, He states that the promise will be fulfilled immediately. Sarah laughs, possibly in disbelief, but more likely at the sheer preposterousness of what is happening. She has passed the period of menopause; the phrase “my lord is old, shall I have pleasure?” would seem to mean that they no longer share the marriage bed. Of course, Sarah is full of fear and awe to be in God's presence. But God here creates a friendly, personal relationship with Abraham and Sarah. Rather than appearing as a fearful voice or a shining angel, he comes as an ordinary man. God's encounter with Abraham and Sarah, anticipating the life of Christ, tells us that part of our relationship with God is to be personal and friendly. Once we fully establish our faith, our commitment, the very sacrifice of our flesh, we may sometimes treat with God as a friend. He is not an Eastern potentate, upon whose face we may never look. Although we worship Him in all humility, sometimes with great show of reverence, our relationship with Him is multifaceted and can sometimes be familiar and conversational.